Property 15: House On 2 Levels, Luxurious Garden, Outside Shower, Stunning View! Property 16: Beautiful Cottage with Private Gardino 250 meters from the Sea !!!!! Property 20: The house on the Gulf. House overlooking the beautiful Poetto coastline. Property 22: Seafront house with private entrance to the beach. Property 26: Villa overlooking the sea at 100 meters from the beach. Internet WiFi. Geremeas. Property 29: Relaxation and freedom by the sea! 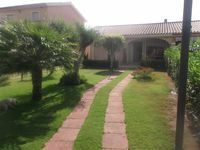 Property 32: Elengant typical house with garden, quiet zone, near beach and center city. Property 36: La Terrazza sul Porticciolo and the "Residenza la Piazzetta"
Villa surrounded by greenery 150 m from the sea. Special price may offer. Property 38: Villa surrounded by greenery 150 m from the sea. Special price may offer.